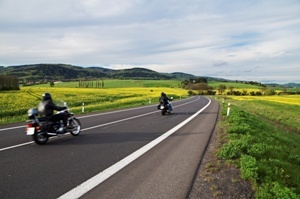 The Best Motorcycle Riding Tips From Federal Safety Experts | Holland & Usry, P.A. Motorcycle riders know their passion is one that has to be experienced to be fully appreciated. Cruising the freedom of the open road without being cooped up in a cage and enjoying the unique challenge of two wheels is an exhilarating joy to be treasured. But with that treasured joy comes lurking danger. To help avoid it, here are tips from The National Highway Traffic Safety Administration (NHTSA)— pronounced "NITS-uh"—a branch of the U.S. government’s Department of Transportation. Its stated mission is “Save lives, prevent injuries, reduce vehicle-related crashes." The NHTSA gives us the hard facts: Sadly, riders are 27 times more likely to perish in crashes, according to 2014 statistics. And many crashes occur because car drivers claim they didn’t see the rider. Bearing these sobering facts in mind, we share these safety tips from NHTSA to help make your ride a triumph, not a tragedy. I’m not beating you down here, as I’ve already told motorists to look out for you. That doesn’t mean they’ll listen, as experience has shown. Position yourself to be seen. Ride where others can see you. Avoid the car’s blind spot—the left and right rear of the vehicle. Use headlights, day and night. Anticipate problems and road hazards. Watch both the road surface and traffic ahead. Road hazards can spell disaster for a rider, so be on the lookout for potholes, oil slicks, puddles, ruts, uneven pavement, railroad tracks, or objects on the road. Go around hazards, if possible, and slow down to do it. Before stopping or changing lanes, check rearview mirrors. Unexpected stops can cause rear-end crashes, sending you over the handlebars and face first into the pavement. Remember that intersections are especially dangerous. According to NHTSA, about half of motorcycle-vehicle accidents occur there. Don’t trust any vehicles. If your vision is limited by shrubs, parked cars, or buildings, slow down, double check for any potential traffic, and be ready to react fast. It could save your life. If you don’t want the thrill of breaking the law at breakneck speed to be your final memory, don’t do it. NHTSA states it best: “Maintain a safe speed consistent with driving conditions and your capabilities.” If you’re a new rider, go slower until you get better at it. The most dangerous time is the first few minutes of rainfall, due to oil slicks or other leaks on the roadway. Be especially careful not to follow too close. Some riders find they get better traction driving in the tracks of vehicles in front of them. But again, just don’t follow too close. Avoid painted lines and metal surfaces because they offer less traction, which could create a terrifying hydroplane. Tailgating is deadly, pure and simple. NHTSA’s position on it is equally pure and simple: “Don’t tailgate, and don’t let other drivers tailgate you.” When you tailgate, I say you let the driver ahead drive for you. That’s because, while they can see upcoming road hazards, you can’t—and you’re not giving yourself enough time to respond to them once the other driver gets past them. When you get tailgated, NHTSA advises to wave it off with a hand signal or tap your brake pedal. If this doesn’t help, change lanes or pull off the road to let them pass. It’s just not worth putting your safety in the hands of an irrational jerk. Passing should be done on one condition: it’s safe to do it. Never pass or ride on the shoulder. Before passing, pull over to the left third of the lane, and be sure you keep a safe following distance. Before changing lanes, do a head check. You should use both brakes together, applying them firmly and progressively. Before stopping, bring the bike upright. Remember that water can hurt brake performance. After going through water, look for traffic behind you, and when it’s safe, check the brakes with light pressure. Unfortunately, the biggest threat to rider safety is often other drivers. If you’ve obeyed all the rules of the road and been hurt in a motorcycle accident, the injuries can be devastating, causing medical bills to pile up while you can’t work to pay them. You need legal help to give you the protection that you couldn’t get on the road. We help folks just like you. If you’ve got questions about a motorcycle accident, feel free to start a live chat right where you are to get your questions answered by an experienced motorcycle accident attorney.